The Marcellus Effect: Frack Sand: Coming to a Railroad Near You? 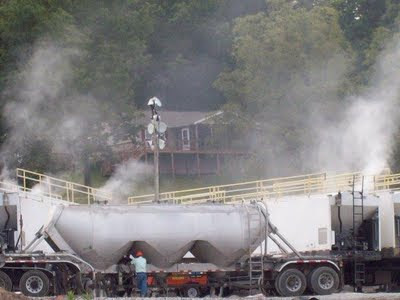 OSHA has come the past month or two to test two fracking sites in our county and tested the workers and the results will be available in about a month to see if the silica dust exceeds the allowable limits. And you are right about the wind-blown silica dust down onto homes nearby and areas where people live, who are not covered by OSHA. Thanks, for this article. thank you for taking videos that show what workers and residents experience in gasland.